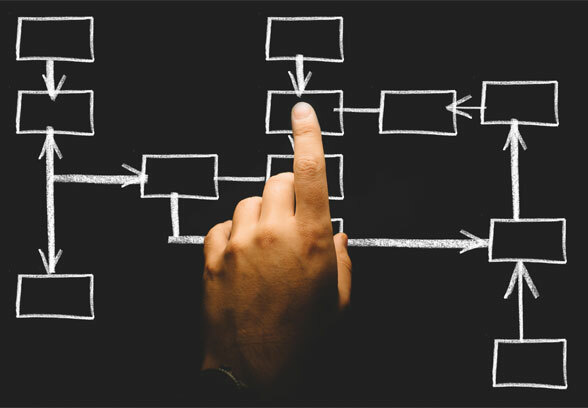 Enterprise resource planning (ERP) is a category of business-management software—typically a suite of integrated applications—that an organization can use to collect, store, manage, and interpret data from many business activities, including product planning, purchase, manufacturing, or service delivery. ERP systems initially focused on automating back office functions that did not directly affect customers and the public. Front office functions, such as customer relationship management (CRM), dealt directly with customers, or e-business systems such as e-commerce, e-government, e-telecom, and e-finance – or supplier relationship management (SRM) became integrated later, when the Internet simplified communicating with external parties. ERP leverages information in the resources under its management to help the enterprise collaborate with other enterprises. It goes beyond the corporate walls to interact with other systems. Enterprise application suite is an alternate name for such systems. We are a niche solution provider for ERP, focusing on extending the capabilities of Microsoft and Oracle platform to address business requirements. We develop innovative solutions on SharePoint and Oracle platform to enable businesses with new capability and provide them with the competitive advantage. We are expert and have experience in delivering an ERP solution and implement industry best practices reduced time–consuming project tasks such as customization, configuration, testing and training. In addition, our best practices reduced risk by 71% compared to other vendor’s custom implementations. As we know, ERP scope usually implies significant changes to staff work processes and practices. So we provide three types of services to help implement such changes – consulting, customization, and support and to implement ERP solution we follow modular and phases approach. 1. Microsoft Dynamics AX (formerly Axapta) – multi-language, multi-currency enterprise resource planning (ERP) business software with global business management features for financial, human resources, and operations management as well as additional industry capabilities for retailers, professional service industries, financial service businesses, manufacturers, and public-sector organizations. 2. Microsoft Dynamics GP (formerly Great Plains Software) – ERP software for small and midsize businesses: helps manage financials, supply chain, and employees. 3. Microsoft Dynamics NAV (formerly Navision) – business management solution that helps small and mid-sized businesses manage their financials, supply chain, and people. It features multiple languages and multiple currencies. 4. Microsoft Dynamics SL (formerly Solomon IV) – designed for project-driven organizations in North America. Business management software that supports future business growth. 5. Microsoft Dynamics C5 (formerly Concorde C5) can assist with finance, manufacturing, supply chains, analytics and electronic commerce for small and medium-sized enterprises. The latest version is Microsoft Dynamics C5 2010. 6. Microsoft Dynamics CRM is a customer relationship management application, sold separately from Microsoft, that provides sales, service, and marketing capabilities. Microsoft sells Microsoft Dynamics CRM either as on-premises software or as a software-as-a-service offering called “Microsoft Dynamics CRM Online”. We help customers manage the complexities of global business environments no matter if the organization is small, medium, or large in size. As part of ERP applications strategy, ERP applications will continue to be enhanced, thus protecting and extending the value of your software investment. 1. Improve quality and efficiency of the business. By keeping a company’s internal business processes running smoothly, ERP can lead to better outputs that may benefit the company, such as in customer service and manufacturing. 2. Support upper level management by providing information for decision making. 3. Create a more agile company that adapts better to change. It also makes a company more flexible and less rigidly structured so organization components operate more cohesively, enhancing the business – internally and externally. 4. Improve data security. A common control system, such as the kind offered by ERP systems, allows organizations the ability to more easily ensure key company data is not compromised. 5. Increased opportunities for collaboration. Data takes many forms in the modern enterprise. Documents, files, forms, audio and video, emails. Often, each data medium has its own mechanism for allowing collaboration. ERP provides a collaborative platform that lets employees spend more time collaborating on content rather than mastering the learning curve of communicating in various formats across distributed systems.